Part I - Should You Hike the West Coast Trail? It w ill take you from 5-7 days to complete. Hoping to complete it in 5-6 days calls for strong hikers carrying heavy loads and long days. The trail is far more difficult than most anticipate. Don’t judge the distances you plan to cover by looking at the map. 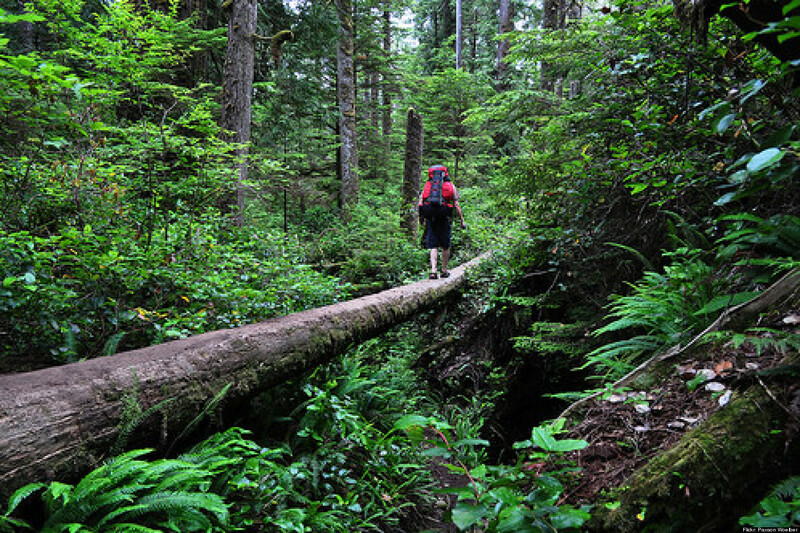 By way of example, it takes most hikers 2-3 days to cover the distance between the southern trailhead and Walbran Creek. Someone in your group needs to carry a watch and be able to read a tide table (not daunting). Park personnel will explain how. Getting caught between 2 headlands as the tide rises (happens more quickly th an most think) is extremely dangerous. Expect most of the following: rain and cold, slippery conditions on boardwalks, wooden ladders of differing heights and angles, muddy trail, cable car crossing that require a fair amount of physical effort, wading rivers, negotiating trail structures that may be damaged, walking gravel and rock/boulders stretches of beach, log crossings, up and overs, down and unders. There are more evacuations on the trail than any other national park in Canada. If you are injured, you can wait more than 24 hours for help. It is not an inexpensive trail to hike: getting there and back, park fees, ferry fees, assorted costs. High creeks and swollen rivers during periods of heavy rain will cause you to wait a day or two before attempting a crossing. If you have a history of back, knee, or ankle problems, the trail will, more likely than not, cause them to resurface or aggravate the injury further. Seriously assess the abilities of those you plan to hike with. More so for parents as youngsters will have to take on challenges (ex. Spacing of ladder rungs) that many adults find difficult. Parks discourages children under 12 and disallows children under 6 years of age. Sept 16 – 30 The West Coast Trail is open May 1 to September 30.RESERVATIONS: Beginning 8:00 am (PST) on March 16, 2015, reservations can be made for any date between June 15 and September 15. Spaces fill quickly, so consider setting up an account prior to March 16.Pachena Bay (north), Gordon River (south) and Nitinat (mid-point). Access or exit at any other point is not permitted unless an evacuation is required. Peak Season: Overnight Use June 15 – Sept 15 To reduce environmental impact and avoid overcrowding, the number of overnight hikers is limited to 68 per day (30 from Pachena Bay, 30 from the Gordon River, and 8 from Nitinat Village).If your party will arrive after 1:00pm on the reserved start date at Gordon River or Pachena Bay, you must contact the WCT Information Centre at your entry point to prevent your reserved spaces from being given to hikers on stand-by. Closure Oct 1 – April 30 The West Coast Trail (WCT) is closed due to prolonged periods of heavy rain, strong winds, high tides, large waves and short days. ACCESS/EGRESS POINTS: Pachena Bay (north), Gordon River (south) and Nitinat (mid-point). ORIENTATION: All hikers must attend an orientation session at any of the trailheads before beginning to hike. Park personnel will advise hikers of animal sightings, problem areas, trail etiquette, no trace practices, etc. These are scheduled at set times during the day. Check with trailhead offices for these times. At the end of your hike, register your party off the WCT. Return one copy of the park permit to a WCT Information Centre or the Ditidaht First Nation Visitor Centre. Permits can be placed in designated drop box if the centres are closed. Parks Canada does not recommend the trip for children under 13 years of age. Hikers should start the trail a minimum of five hours before sunset to ensure a camping area is reached before nightfall. Hiking from Gordon River to Camper Bay in one day is not advisable. Plan to camp at Thrasher Cove. Statistics show that most accidents occur later in the day in this area. set reasonable daily distance goals. For some sections of the trail, it may take the average hiker all day to complete just 6 km. We strongly recommend hikers start the trail a minimum of five hours before sunset to ensure a camping area is reached before nightfall.Hiking from Gordon River to Camper Bay in one day is not advisable. Plan to camp at Thrasher Cove. Statistics show that most accidents occur later in the day in this area. know your own limitations, and the person(s) you will be hiking with. You should never go faster than the slowest member of your group. slower hikers tend not to announce, that, the pace set by stronger hikers is too fast. They will burn themselves out before day’s end and can become a liability to themselves and the group. exposed roots, slippery sections, and a number of other distractions require your constant attention and concentration. Always be aware of where you are stepping. If you want to look at something, or take a picture, then STOP! to do it. The biggest problem I deal with as a guide, with my clients or other hikers that I have lent assistance to, are foot blisters. Avoiding this very painful condition begins with the selection of the proper hiking boots and socks. Don’t borrow or rent hiking boots. They should be sized by experts to your foot requirements. If there is any rubbing, don’t imagine that it will go away once you are on the trail. If anything it will intensify. if you notice any rubbing while hiking (known as a “hot spot”) take care of the rubbing immediately. Don’t think that you will slow down your partner/group by asking to stop to deal with it. It WILL get worse if you don’t deal with it, and you will have created a bigger problem for yourself and others. For this reason, be sure to carry a blister kit with you. It is one of the most important investments you’ll make. As mentioned earlier, the West Coast Trail carries the distinction of highest number of injury evacuations of any national or provincial park in Canada in a given year. Boardwalks – They are a welcomed rest from slogging over muddy trail in the rain forest. In wet conditions, and areas where they receive little or no sunshine, they become a danger. If they are angled in any way (up-down, side to side) there is a greater chance of sliding into an injury. Carrying a heavy pack leaves little possibility to recover your balance once you lose it. Take smaller steps in these circumstances – it is easier to maintain balance. Roots -There will be plenty of exposed roots through the forest. Be very vigilant as to where your next step will be. The same concern with boardwalks is present with angled roots. Avoid altogether stepping on these if you can. Mud/Water Holes – There will be enough of these to satisfy a lifetime. Most hikers will work their way around them. In some instances there may be a small log, rock, or a cedar round (like a stepping stone) that welcomes an easier path than skirting the edges. Be very mindful that this inviting object may not be solidly anchored. Don’t step to anything that you have not tested with a hiking pole, as you may be in for a big surprise. Ladders -These are not as ominous as they may appear. Common sense dictates that you always maintain 3 points of contact with the ladder when taking a step. If traveling with others, it is good practice to allow ample room (as guides we allow the person on the ladder to have completed 3/4 of the ladder before starting the next person) between hikers. This prevents objects falling on the person below, stepping on someone’s fingers, etc. Spacing – When hiking through the forested sections, it is a good idea to leave some distance between hikers. Getting too close to the hiker in front of you obscures your view of where the best route for you to follow may be. You may also be blocking an escape path back from a route that was not a practical choice. Always offer a helping hand to hikers who may require assistance getting around/over an object or warn them of any approaching problem or danger. Beaches -Not all beach walking will be welcomed. There are some beaches that are gravel, soft sand, or have bolder size rocks. It is usually tiring to hike on these. Watch out for larger rocks that are angled, especially if wet. Nor, will all the larger rocks be stable. Easy to turn an ankle or twist a knee. Caution here! Water Crossing - Caution with rock hopping, as the rocks may be slippery or unstable. With deeper water crossings, move slowly and assuredly, especially with fast moving water. Hiki ng poles will give you greater stability. Be sure to undo the waist belt and sternum belt on your backpack before proceeding across knee high or deeper water. Losing your balance and falling into fast, moving water, with a loaded pack that you can’t undo, can hold you under. Shelf Hiking - When the tide is out, there will be opportunities to walk on the rock shelf, thus avoiding gravel or soft sand beaches. It is like walking on a street. Be aware that low tide vegetation can be slippery. Surge Channels - As you hike the shelf, there will be small or large deep channels cut into it. Ocean water has cut these passages through the softer rock over time. Avoid getting too close to the edge of these surge channels as they can be very slippery. Falling into one of the deeper, water-filled ones, may leave no option for rescue. Dehydration & Energy – Drinking water often and eating plenty are essential to the sound management of your body’s needs on this very strenuous hike. Water is plentiful along the trail, but it should be filtered to be safe. Brackish, tea coloured water is not bad water. It’s colour comes from contact with vegetative matter. Signs that you are under-hydrating are headaches and dark coloured urine. This is not the time to go on a diet. You will need to intake at least double your normal calories to provide the energy required. Failure to give proper attention to water and food can lead to headaches, tiredness, loss of concentration, inattentiveness – with serious consequence. Cable Car Crossings – These are situated along the trail to assist hikers over deep or fast moving creeks and rivers. If approached sensibly they are more fun than danger. Gravity will carry the car part way, then human pulling/pushing kicks in. The cable wire and cars are strung between two platforms, a short ladder climb above the shore. You shouldn’t have more than 3 or 4 people up there at one time. The cars are made to accommodate 2 hikers at a time with their backpacks between them – don’t overload the cars. Assuming there are 2 or more hikers, one should be holding the car while the other climbs in or out. If there are 2 hikers it’s helpful to send one hiker across with packs. It’s easier to have someone pull from the platform than to have 2 in the car pulling from a seated position. The most serious situations for injury come from overloading, too many hikers on the platform, not holding the car in place when someone is entering or getting out, and grabbing the overhead cable to lift yourself up and out. The two pulley wheels that roll along the overhead cable can roll over your fingers, with their severing. This has happened on at least 3 occasions. Tent Location – Be aware that by setting your tent too close to the water’s edge or against a sandstone cliff may have consequence. Look for the high tide markings (debris/ seaweed line on beach) and then set your tent well above this line. Getting an unexpected wave hit your tent while you sleep is a jolter. As a caution, I always have hikers set their tent a distance away from a sandstone cliff. They are generally unstable and large rocks can break off at any time.